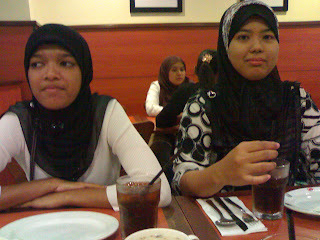 My housemates (Fida and Aizah) and I went to Kuantan last weekend and we had a blast outing. This is us waiting for pizza. Cheap, meh! RM8++ for a meal.. There you go! 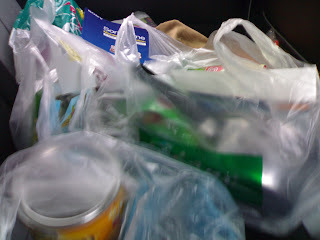 That's more like it...haha...actually there are many other plastic bags hidden from this view...well, what i can tell you is that, the backseat is almost full all the items that we bought..Way to go shoppers! The next nite, my housemates decided it is only fair to cap our perfect weekend by paying a visit to one of the hottest kopitiam around. We (or should I say , I?) 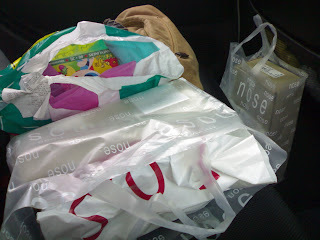 drove to Chukai, 40 km away and lepak there. Pretty cool place, huh? I love the environment there. 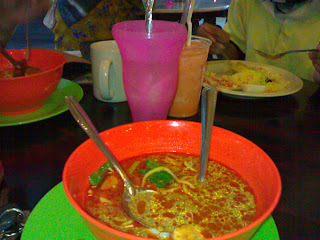 Our meal there...The mee kari is quite good actually. There are many choices of food but don't expect too much coz it's "biasa-biasa je". 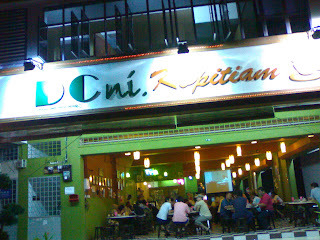 If you go there for food...hmm..not really recommended..but to lepak? surely..
Look at my new watch. I lovvveee it!! It's Franck Muller's Crazy Hour Long Island..original price? USD 31, 800...But I bought it only for RM 60 at lelong website..When I have a millionaire husband, this is surely a must buy! Drool people, drool! wahahah...best2 berbelanja kan. aku suka buat mende2 camnih. 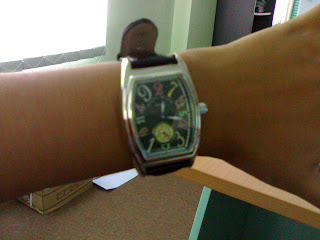 siap ade beli jam murah lagik ek ngko!! melampau sangat...nasib baik lawa. tak reti ke nak tulis nama sendiri?